Beautiful View of Main Channel and Tan-Tar-A Island! This breathtaking, panoramic view includes a private pool! Beautiful lakefront home with a view for miles!! Only two steps entering the front door from parking! 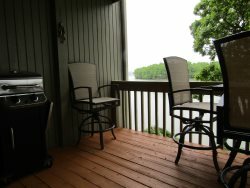 Unique, pet friendly home offers a large deck, dock and a beautiful view!